The Bravůr Family Microbrewery was founded in 2009 and continues the tradition of brewing beer in Loučná nad Desnou, where in 1743 a brewery was founded which basically stood on the same spot as today's microbrewery. One of the main reasons for establishing the Bravůr family brewery was to supplement the renowned gastronomy of the restaurant and guesthouse Na Staré Poště with a high-quality classically brewed beer. The Loučna beer Kvasslav is brewed from the finest traditional local raw ingredients – Haná malt and Saaz hops, water from the foothills of Jeseníky, and live brewer's yeast. The renowned traditional Czech open fermentation technology ensures an excellent aroma and flavor. At present, the microbrewery brews 22 kinds of beer, both bottom and top fermented. The basis for the entire year consists of bottom fermented beer, light lager 12° and semi-dark lager 12°, which are replenished by a range of multi-grade specials and top fermented beers according to season and demand. 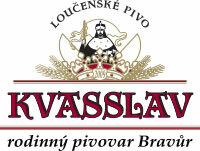 Given the small annual production (250 hl) of beer, most of the Kvasslav beer is sold at the restaurant (bottled and draft) and at beer gardens in the region of the Jeseníky Mountains, occasionally in Olomouc and Brno. Free tours are possible only upon prior agreement and, due to the brewery’s small size, only for small groups (10 people). To ensure that microbrewery fans can taste the Kvasslav beer, we participate in national and microbrewery regional shows and beer festivals.